Print books, beloved as they are, have become an outdated technology. They were once a convenient and easily portable way to bring entertainment with you to easily consume. But the open source and, therefore, extremely versatile entertainment systems of the 21st century have rendered books – which seem large and clunky by comparison – obsolete. It is like lugging around a Walkman and a booklet of CDs around in this day and age; it is just not worth the hassle. Smartphones do indeed make carrying around and reading books much more convenient with their wide selections of reading apps, but many see them as too small to have a satisfying reading experience while using. The more recently reintroduced tablets, however, change this. Below is a list of some of the ways reading from the Nook reading app for Android tablets makes reading a pleasure instead of a hassle. Portability – Stephen King writes a lot of very long books, often in excess of 600 pages. Needless to say, carrying around such thick tomes is not exactly convenient. Oftentimes, in fact, readers will leave their books at home just because they don’t want to deal with carrying it around. You may be thinking that sounds ridiculous, that carrying around a 1-pound item could add that much inconvenience. But when you’re used to only carrying your tablet, phone, and wallet, it really does. With Nook for Android, though, you can bring all your heavy books with you while adding literally no weight to your load, just by adding “portable library” to your tablet’s many functionalities. An HD Experience – Many people who love reading print books are skeptical about reading off the screen of a portable device. They fear that reading would feel cramped and artificial on an LCD screen rather than the paper pages of a traditional book. Within a few minutes of adopting the technology, however, many realize how wrong they were. A tablet’s screen dedicates every pixel to creating an expansive, authentic feel when you’re reading. The colors are amazingly crisp, too. If you have been avoiding eReaders because you envision the experience to feel like reading a black-and-white word document or web page, you should be aware that it is instead even more vibrant and welcoming than reading a traditional book. Text Searching – How many hours you have wasted searching back through portions of books to find specific phrases or quotes, whether it because they are inspirational or because you want to cite them in a paper you’re writing? Nook’s Android app makes it so much easier to find passages you want by incorporating an easy search feature. Just type what you want to find into the search bar, and your tablet will instantly show you all the instances of the words in the book. Audio Additions – Nook for Android’s ability to play audio files is very useful in two ways: first of all, you can play ambient music files stored on your tablet while reading to drown out annoying background noise and focus your mind on the text. Second, you can listen to your books rather than read them. This is possible whether or not you have the audiobook on the tablet, because Nook has a fantastic text-to-speech function. Night Mode – Books are very immersive and envelop your entire mind, so a good book is easy to get drawn into. There is nothing more frustrating, though, than when you cannot continue a book you are invested in because it is getting too dark to read. 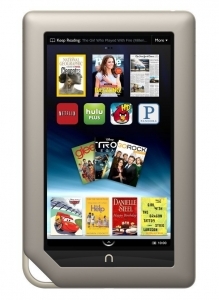 Because Nook for tablet is on a backlit LCD screen, however, you will always be able to see the words just fine. Nook even sports a night mode where the page becomes black and the words become white to avoid bothering your neighbors or your own eyes. For all you skeptics out there, eReading on a tablet is actually a very authentic, convenient way to devour books. Even if you’ve already experienced that fact for yourself, though, we can assure you that, of all the reading apps for Android tablet, Nook, available for free on the app store, is the truest to form and easiest to manage.